How did World War II internment affect you? On Feb. 19, 1942 -- 70 years ago -- President Franklin Delano Roosevelt signed an order authorizing Japanese-Americans to be relocated from the West Coast of the United States and sent to internment camps inland. More than 110,000 people lived in the camps. 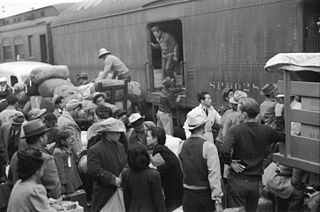 In this 1942 photo from the Library of Congress, Japanese Americans going to Manzanar gather around a baggage car at the old Santa Fe Station in Los Angeles. What did you or someone you know experience before, during and after the war years? What was the lasting impact of internment? Responses are confidential, so nothing you share is aired or published without your permission. A KPCC journalist will write you back.